HGDMRS currently has one operational N gauge layout – Figgton, whilst a second layout based on Craven Arms is in the research stage. This small branch terminus layout was started, but never finished, by former club member Brian Figg. Sadly Brian passed away two years ago and the layout was put in the hands of the Hazel Grove Society. 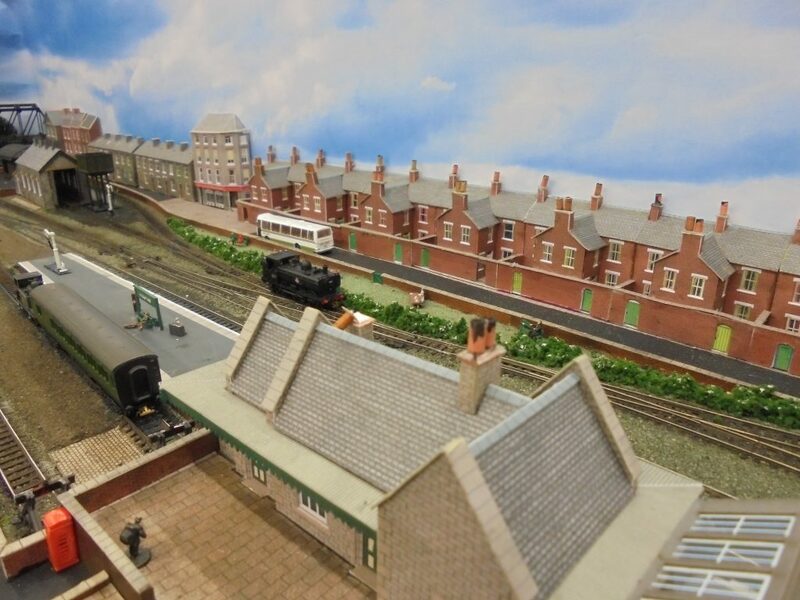 A number of N Gauge modellers in the society decided that it would be a worthy task to refurbish and complete the layout, with the aim of exhibiting it in Brian’s honour. Figgton is a small country terminus, with all the expected facilities of a goods yard, engine shed and a dairy, set somewhere in Southern /Western region of British Rail territory during the late 50s/early 60s. The trains by Farish™ and Dapol™ ,with a few kit built items sourced from the usual suppliers including the N Gauge Society. Hands free shunting is available care of the DG coupling system. Track is Peco™ code 55 and control is conventional DC. Refurbishing and completing Figgton is proving a good training ground for some newer members to acquire skills they never thought they had and older ones to keep their hand in !! We are now at the stage where we have decided on the nature of the next N gauge layout. It will be based on Craven Arms in Shropshire. We’re aiming for Exhibition standard in the build, and we will look to making the layout suitable for two eras; the transition from steam to diesel and the early days of blue diesels. Initially the layout will be built for DC operation, but wired to enable conversion to DCC operation in the future. We also will be using the baseboard design used by both Youngstown and Aldwyn Brook, but modified as necessary to suit our needs and requirements. Design of the baseboards and the topography of the layout is now in hand, and we expect to start baseboard construction soon. Of course we always need more hands to make progress, so if you are an N Gauge fan, please come along to the Club any Monday and / or Friday evening to see the layouts and lend us your support. Getting involved in the Craven Arms project at an early stage is a great way to gain experience. Most Team members also have a home layout (or two) some of which can be seen on the exhibition circuit. Our interests are wide ranging – steam era, transition era, modern diesels, both DC and DCC control, kit building and painting etc. We are always willing to offer advice and to help out with problem solving, so do come along to one of the club nights.